Heraldry: Ecclesiastical Heraldry in the News! No, I don’t (yet) mean the arms of the new Pope. 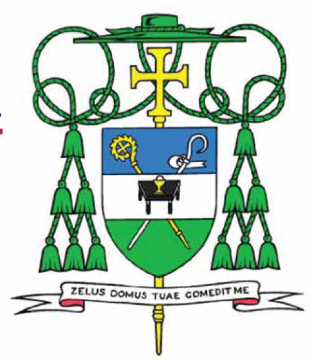 The new Bishop of Las Cruces, New Mexico, the Most Reverend Oscar Cantu, has his coat of arms emblazoned, blazoned, and discussed in an article on the website of television stations KVIA, which serves both El Paso, Texas and Las Cruces, New Mexico. Further, I would note that not even the College of Arms in London is any longer blazoning tinctures with “of the first,” “of the second,” etc. as being confusing. Witness the blazon in the second paragraph quoted from the article, where you have to hunt through three-quarters of the blazon to figure out which tincture is the “fourth” one cited. It’s easier simply to repeat the tincture if necessary. Which isn’t necessary anyway in my proposed blazon. As a final quibble, the croziers are not “per bend” and “per bend sinister.” The gold one is “bendwise,” “lying in the direction of the bend” according to J.P. Brooke-Little’s An Heraldic Alphabet, and by extension the white crozier is lying in the direction of a bend sinister. “Per bend” is how it would be divided if it were of two different tinctures with the line of demarcation running down its length. This is not the case, and even if it were, it would be a crozier “bendwise per bend A and B,” with A and B being different tinctures.